Right now my favorite artist is Carrie Newcomer. I enjoy mellow, acoustic, female singer-songwriters. Other genres I like are folk, celtic, world music (esp instrumental), acoustic, mellow jazz, and kid-friendly silly songs! Favorite podcasts: Welcome to Nightvale, Harry Potter and the Sacred Text, BBC Witness, A Way with Words, The World in Words, Death in Ice Valley, Order 9066, The Memory Palace. Very powerful but heartbreaking: Believed, from Michigan Radio (about Nassar abuse victims). I started with ATCs in summer 2008 and then branched into postcards - I'm not the first to say it, but the larger canvas of a postcard appeals to me! 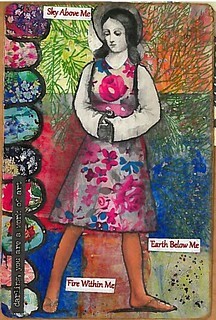 I like to make fabric / needlework PCs and ATCs, or collage-y style postcards. I dabble in colored pencil drawings - I mostly draw botanical and entomological subjects (flowers and insects) from photos. I also like block printing (linocut, although usually not on actual linoleum). I always appreciate your own drawing or painting on an ATC or postcard! And no matter how you make it, I appreciate a note about how you made your creation, what you were thinking of, etc. The creative process fascinates me. I'm a blues and greens kind of gal! My least favorite colors to work with are 'muddy' colors, like drab browns and yellows and such. I admire people who can make them work! I like botanicals and nature-inspired items, or abstract/geometric/swirly stuff. unusual animals, such as zebras, okapi, pangolins, even intriguing arthropods (giraffe weevil, colorful beetles and bugs, sea life, etc). The less well known, the better. [granted, zebras are charismatic megafauna, but I make an exception for them!] Live snakes in my immediate proximity (such as pets) make me shudder a little bit, but I'm okay with them in art. Also appreciate black-and-white (or limited color) illustrations from old science or other textbooks. I've collected quite a pile of them from the free shelf at my public library! My current jam is listening to the Hamish MacBeth series (audiobooks). I've also been listening to Agatha Christie - especially a lot of BBC Radio 4 adaptations of the Hercule Poirot series. Our local library is part of a state-wide consortium for ebooks and e-audio, so I often listen to whatever is "available now" rather than following a series in order (and this works for Poirot, since most stand alone). My favorite book is Gaudy Night by Dorothy Sayers. My favorite authors are Madeleine L'Engle and Dorothy Sayers. My favorite books are mysteries, especially when they incorporate an interest of mine (cooking, needlework, etc) without it being too forced - e.g. "cozy mysteries." Inspector Henry Tibbetts (by Patricia Moyes) and Maisie Dobbs (by Jacqueline Winspear) are two great series in this vein. And I've been reading quite a bit of young adult fiction to keep ahead of my boys or find books they might enjoy. Recent favorites include The Hunger Games and Catching Fire by Suzanne Collins; Navigating Early by Clare Vanderpool. Our whole family enjoyed The Wilderking Trilogy by Jonathan Rogers - great especially for boys! Others: Mysterious Benedict Society (I liked the first one the most), The Wednesday Wars, Madeleine L'Engle, J. K. Rowling, Blue Balliet. For postcards: I ADORE handmade postcards!! But if you don't make your own, I also like maps, native plants or animals, quirky local sites, artsy stuff. For tea swaps: my favorites are flavored white or green teas. Also like herbal or rooibos and chai mixes. I'm slowly learning to appreciate loose black teas tends. My husband is a big fan of Earl Grey/Gray and its variants. And this may sound a bit whiny, but I consider a bag of ordinary Lipton to be the tea-swap-equivalent of 'sticker slapping' (representing little time or effort). For recipe swaps, I have recipe boxes for 3x5 and 4x6 cards, and a file folder for 8.5x11 paper. So I'm flexible on formats. I love to cook from fresh & seasonal ingredients, and I like ethnic recipes and "food with flavors" (interesting spices). And chocolate - I loves me some chocolate! Be brave. Be truly brave. I mean, don't get carried away. Stay out of the Dog Park. And don't run with knives. And, for crying out loud, don't cry out loud. You'll upset the bears, which are emotionally fragile animals that are already very uncomfortable with themselves. Today is street cleaning day. Please remain calm. Comment: Thank you. Halcyon has a whole new meaning for me now. Comment: Really cool! I think Kingfishers are absolutely stunning birds! I see them quite often around the rivers here in Missouri. I really liked seeing the Kingfisher stamps you included in your zine! Comment: Hello Tricia! Thank you for the fun buddy. Peppers and frogs. Tastes like chicken! LOL. How fun to find a great source for images. Thanks again! Comment: Tricia: If I could give you a 10 I would! You have sent me the most wonderful collection of images - thank you so much! I absolutely love everything you sent and love how many vintage items you included. This is the first swap like this that I have done and I am going to take special note of what you have sent when I do another swap like this one. Thank you!!! Response: I'm glad you liked them! Comment: Great postcard;) Thank your! Comment: Love the underwater scene-thanks! Comment: LOVE IT, thank you! Comment: What a great way to upcycle esp. since it's a fab color! Thank you for the pirate and gold pc! The octopus is a great addition! Comment: I love your carved pig! Thank you! I wouldn't have even noticed the extra middle hoof! I'll definitely look for you on Words with Friends! Comment: Thanks for the great pc, love the flowers and birds! Comment: Your card and note tickled my funny bone and my "Oh-this-is-charming" bone. I love the reference to St. Anthony and swineherds. Thank you for the great postcard and note! Happy Year of the Pig to you! Comment: Thank you, Tricia! I was so looking forward to receiving my swap from you and you didn't let me down.I love my clouds. And I will check out gorgeous storm. Thanks again! Response: Glad you like them David! It was fun to carve. Right and Left Brain Unite! Wow, Lucky ME!! Thanks for the extra CC SC PC! I love using up scraps (HAHA, I just hosted one recently), and make these PCs or masterboards often! I’ve joked that one of these days I’m going to cover my dining room table and JUST make Scrap masterboards for PCs! Happy Summer! I forgot to say how much I love the Jack-in-the-Pulpit print you made/sent. I have a lot of them in my yard - one of nature's delights. Thank you. Got the second Nature Inspired PC and gelli background is really great! You went over and beyond, thanks! Thank you for working on my Collaboration PC, with the ship cruising down the road. I love it. Here's the finished Collaboration (#41 for you). I added shading, an outline and some words. Thanks for a package of goodies, and the most excellent pig & sheep parasite envelope. love it! I think this was an RAK? ...but let me know if I have missed rating you on anything.